Learn how to choose the HTML or PDF template for a manual. Right click on a manual and select Inspect. Choose the template you would like to use for the manual. The template will be used the next time you export. If I select a certain template for the manual, shouldn't this template also become the 'default' for any of the lessons in the manual? Specially the PDF template? Not necessarily as a lesson exists independently of a manual can be used in multiple manuals and on it's own. Perhaps a feature that applied the manual defaults to all lessons though? Forgot about independent lessons in the lesson library. So the default template for a manual works only also for lessons if the whole manual is uploaded and the PDF's of the manual and lessons are created, not if I upload a single lesson from that manual? Right. 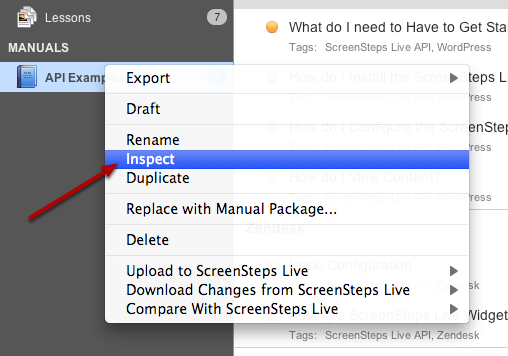 If you upload a manual to ScreenSteps Live the default template is selected by default. When uploading a lesson to ScreenSteps Live the default template for the lesson will be selected by default. You can, of course change the template that is used. One thing I've thought about is assigning default templates to ScreenSteps Live accounts (and web export accounts in general). (I keep clicking the 'don't want to receive emails any more click here' link, darn). Thinking aloud here, based on how I'm using ScreenSteps Live at the moment. Some lessons do indeed belong to different manuals in one space. Although they have the same PDF template now I can imagine that manual 1 could have another template than manual 2. So in fact I've kind of answered my own question on default templates per manuals upload versus default per individual lessons upload. 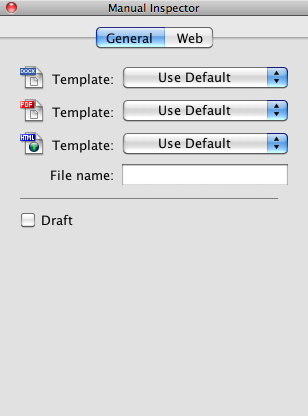 So not sure if and how assigning default templates to ScreenSteps Live accounts or general web export would/could work?